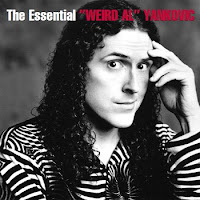 That's right - you can pick up your own copy of The Essential "Weird Al" Yankovic today! This jam-packed 2-CD collection features Al's best work from his 12 studio albums, including hits like "White & Nerdy," "Eat It," "Amish Paradise," "Like A Surgeon," and "Smells Like Nirvana"! You'll get 38 classic songs (hand-picked by Al himself) - over 2 1/2 hours of music - all beautifully remastered - plus a full-color 24-page booklet - and all for one amazing low price! The Essential "Weird Al" Yankovic is available at record store, online retailers...pretty much everywhere that music is sold. Click here for more information and pick up your copy today! - Sign up for the Weird Al Mailing List for more updates like this or just stay tuned into the SykoMusic feed and twitter .